In the early 1990s, I introduced the term “oxidative coagulopathy” for a state in which microclots composed of blood plasma alone or plasma with blood corpuscles form in the circulating blood. In the late 1990s, I recognized the more fundamental roles of oxygen’ signaling, cellular detox, and cellular detergent functions. 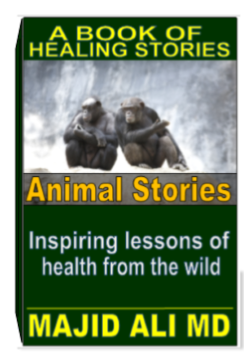 In 1998, I introduced the term dysoxygenosis (dysox, for short) in an article published in the Journal of Integrative Medicine for a state of disrupted oxygen homeostasis. In that context I coined the term dysoxic coagulopathy. Below I present two photomicrographs of fields of circulating blood obtained with high-resolution phase-contrast microscopy lwhich illustrate the earliest changes of dysoxic coagulopathy. The blood samples for this study were obtained finger sticks. These photomicrographs illustrate the earliest changes of dysoxic coagulopathy. 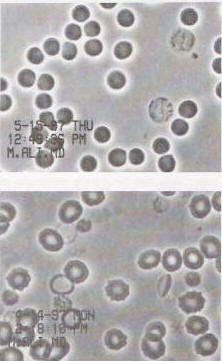 The upper frame shows normal appearance of healthy blood cells while the lower frame shows deformed cells. Healthy red blood cells are round with regular and smooth outlines (dark bodies shown in Figure 1). Two pale cells larger in size are lymphocyte, while a smaller and darker body just below the upper white blood cell is a blood platelet. The fluid part of the blood called plasma is clean and free of microclots. The above photographs were published in an article I and my colleague, Omar Ali, M.D. published in the Journal of Integrative Medicine in 1997). Below are captions for the photographs as they appeared in the original article. Figure 1 (top): All erythrocytes and two lymphocytes shown in the photomicrograph keep their distance from each other (due to negative electrostatic surface charges) and show regular outlines. Note that none of the well-preserved erythrocytes are discoid in shape. Figure 2 (bottom) shows early changes of AA oxidopathy with many damaged erythrocytes. Blood Cell Biology Or Endothelial Biology?